Our purees and powders are “Easy 1, 2 & 3”. Just add ice, water & blend! Our real fruit purees contain no high fructose corn syrup, cane or beet sugars and are available in a traditional or low-calorie line. Both puree lines are shelf stable even after opening. 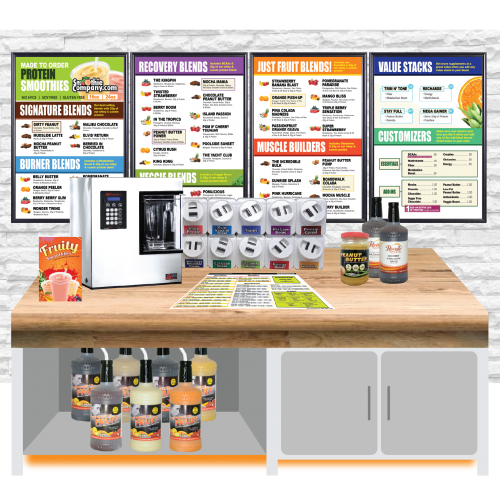 Our proprietary smoothie bar system minimizes waste and human error through portion control and consistency. We offer a broad range of products to fill your smoothie bar needs: real fruit smoothie purees, essential powder supplements, delicious smoothie add-ins, premium quality protein powders and more. We manufacture two lines of the finest fruit purees made from fruit picked at peak ripeness. Both fruit purees contain No HFCS, are gluten free, 99% fat free and only contain .001% of a preservative to make sure they stay shelf stable for up to 12 months even after you open them. Both real fruit puree lines feature a natural profile flavor that is a complete, 180 degree, departure from the low quality smoothies you find at fast food locations. This is a difference your customers can taste and love. Our traditional real fruit puree line, Cruisin' Cool, contains all of the goodness of fruit packed into one half gallon bottle. Our low-calorie, lower sugar line of real fruit purees, Power of Fruit, are sweetened naturally with real fruit and all natural stevia. Smoothies made with this product maintain a natural taste but contain up to 50% fewer calories and sugar than a smoothie made with our traditional mix. This line of puree is also gluten free, 99% fat free, contains no HFCS and is free of any artificial color, artificial sweeteners and soy. Choose one line, or both for your complete smoothie bar program. We offer the following flavors: Orange Creme, Passion Orange Guava, Strawberry, Banana, Mango Peach, Raspberry, Triple Berry, Pina Colada and Pomegranate Cherry. A modern smoothie bar would be nothing without alternative protein and supplement options. We manufacture our own good-for-you ,native whey and casein protein powder in both chocolate and vanilla. Our real fruit purees lend a natural sweetness to every smoothie so we can offer some of the cleanest protein powder in the industry. Each protein powder flavor contains minimal grams of carbohydrates, sugar and fat. They are also free of any artificial sweeteners or colors and are scientifically designed to blend with our products. As for our supplements, we offer customer favorites as well as some on-trend products. Our available supplements include: Multivitamin, Energy, Metabolism Boost, Fiber, Creatine & Glutamine. Our delicious smoothie add-ins include the best-selling veggie boost as well as our all natural pumpable peanut butter, our low fat powdered peanut butter, honey cinnamon granola, mocha and our sugar free and traditional chocolate sauces. Customers love to boost and customize their smoothies so our supplements and add-ins are great up-sell opportunities that let each customer create a smoothie that is unique to them. Using our products listed above there are endless possibilities to the smoothies you can make. It's really that simple! 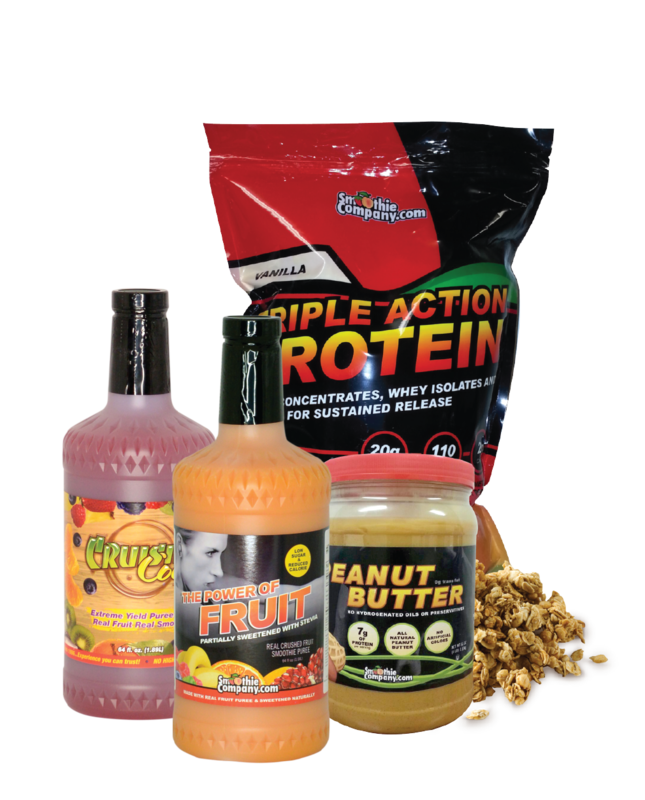 Click here to view our smoothie bar starter packages that include these products. Manufacturing our own products is not the only thing making your smoothie bar profitable. We also put in place a proprietary portion controlled system that prevents the human errors and waste that occurs when using our competitors products. This system ensures a quality and consistent drink every time no matter who is tending to the smoothie bar that day. We also produce our own branded napkins and 16oz. & 24oz. 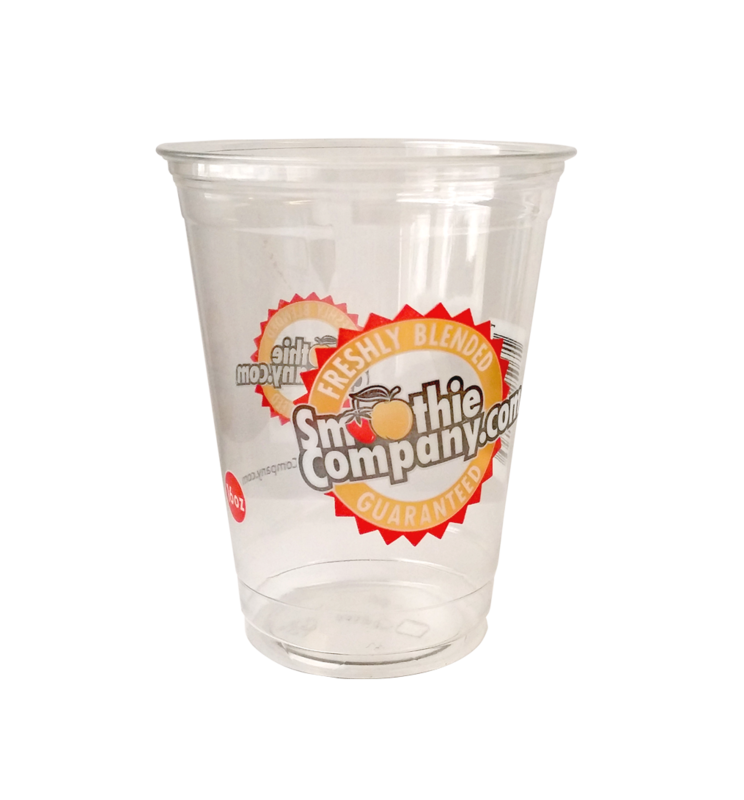 clear plastic cups complete with dome lids and straws to give your smoothie bar a unified look. All of our accessories and supplies are curated with this thought in mind: keep it efficient and simplistic. We are proud of how simple, profitable and easy-to-run our smoothie bars are for each one of our customers. INTERESTED IN PURCHASING SMOOTHIECOMPANY.COM SUPPLIES?